We all do, right? Reach out to local companies in our community and let them know how much you love the GLAA! Tell them you have referred them for membership and submit their contact information below. We will follow up by sending them a Membership Packet! Properties - be sure to look at your vendor list and reach out to those who are not already members! Vendors - be sure to reach out to the properties that you do business with and refer them! The best part? 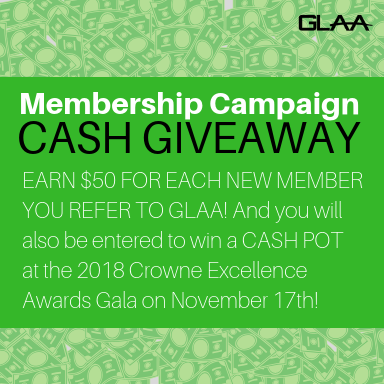 If they join, YOU get $50 and a chance to win a CASH POT at the 2018 Crowne Excellence Awards on November 17th!